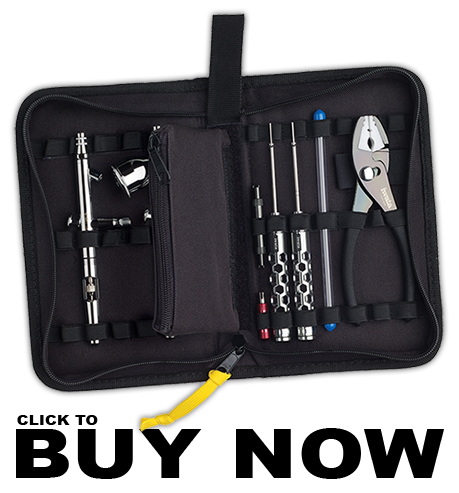 The kit comes with a two-sided Iwata Air Valve Wrench, Iwata Soft Jaw Pliers, and Iwata Needle Packing Screwdrivers in 1.2mm and 1.4mm diameters, Iwata Nozzle Wrench, and a protective replacement needle tube. All of the items fit securely in the elastic straps within the protective case. The inner zipper compartment is ideal for carrying small replacement parts and the pouch has extra room to carry up to three gravity-feed or siphon-feed airbrushes.